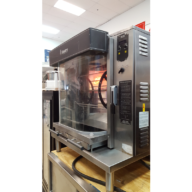 GMT-10S - USED SOUTHBEND 10 GALLON TILTING KETTLE INCLUDES FREE SHIPPING - Delray Food Service Equipment & Reconditioning Inc.
A double wall kettle interior shall form a steam jacket around the lower 2/3 of the kettle. The bottom of the kettle shall be of hemispherical design for superior heat circulation. The kettle interior shall be of 316 stainless steel for high acid content products. The stainless steel mounting legs shall have the steam supply and condensate within the legs and the right leg fitted with a steam control valve for the kettle. Each kettle shall be fitted with a tilt handle and heat resistant knob, allowing the kettles to be tilted forward past 90° for complete emptying. The kettles shall be mounted on a cabinet base with full perimeter angle frame, reinforced counter, hot and cold water faucet with controls valves 3” (76 mm) deep sinks with drain, grates and splash guard, hinged doors with magnetic catches, removable side panels and 6” (152 mm) stainless steel legs fitted with adjustable bullet feet on front and flanged adjustable feet on rear for securing to the floor, all #4 stainless steel exterior with aluminized steel back. Boiler controls shall include automatic water level control, automatic blowdown, pressure gauge, water gauge glass, operating pressure control, safety high-limit pressure control, safety relief valve, cathodic protector, On/Off switch with indicator light, and electronic ignition. Steam manifolds concealed within cabinet are fitted with a safety relief valve and steam trap for each kettle.